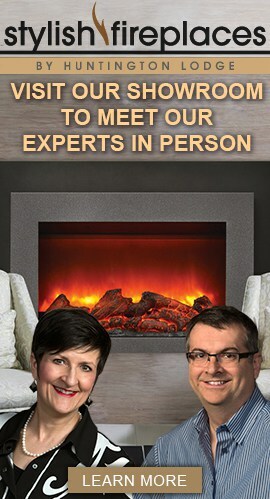 Not a day goes by in our showroom that we aren’t asked to compare gas fireplaces vs electric fireplaces. As more clients become aware of electric fireplaces, it’s only natural that they want to understand the differences of gas fireplaces vs electric fireplaces. Here is a summary of the major differences between gas fireplaces vs electric fireplaces. Gas fireplaces vs electric fireplaces – Which is better for heat? Many people don’t realize that almost all electric fireplaces have heaters in them. The difference between gas fireplaces vs electric fireplaces is that an electric fireplace may be operated with flames only, without the heater running. This cannot be done with a gas fireplace – if a gas fireplace is on, it is producing heat. This means that electric fireplaces are more flexible than gas fireplaces and can be operated comfortably year-round. Another difference of gas fireplaces vs electric fireplaces is the amount of heat produced by each. A typical electric fireplace produces about 5000 BTUs of heat, enough to take the chill off a space of about 400 square feet. Gas fireplaces, on the other hand, have heat output starting around 15,000 – 20,000 BTUs for a small insert, and go up from there. The larger the burner, the more heat output. This means that a gas fireplace can produce enough heat for a much larger area than the electric equivalent. However, this heat is often confined to a single room, and may be too much for that space. This generally limits gas fireplace usage to the coldest days of the year. Gas fireplaces vs electric fireplaces – Which is better for TVs? Like it or not, people are mounting TVs above their fireplaces. When it comes to gas fireplaces vs electric fireplaces, there are some important differences in how this may be accomplished. Because of the differences in heat output, as described above, there are differences in how TVs may be mounted above gas and electric fireplaces. When mounting a TV above a gas fireplace, care must be taken to protect the TV from the intense heat from the fireplace and the wall around the fireplace. Because electric fireplaces do not heat up the surrounding wall, and have far less heat than their gas counterparts, TVs may be mounted much closer to the top of an electric fireplace. This means that you can mount the TV at a more comfortable viewing height if you are using an electric fireplace below the TV. 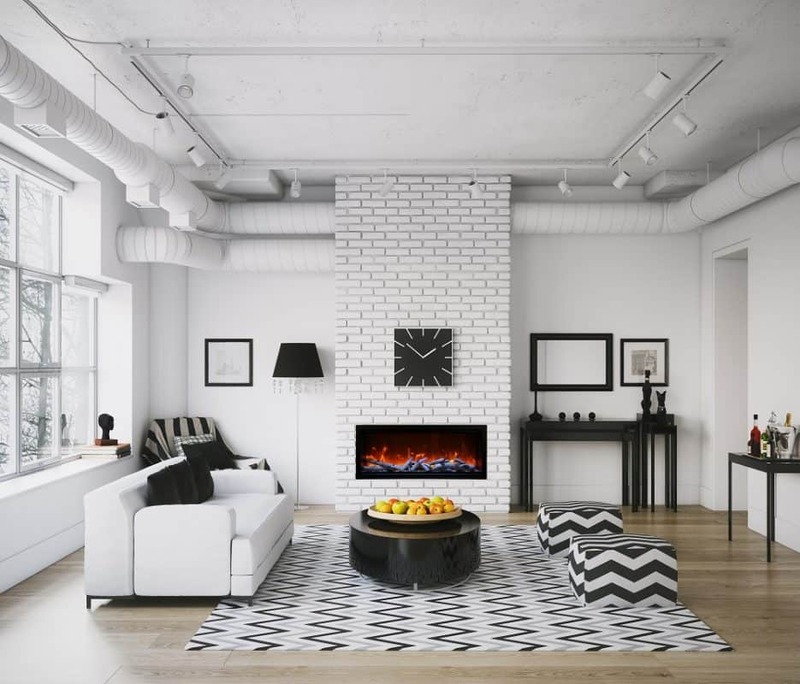 Gas fireplaces vs electric fireplaces – Which is better for designing a wall? When it comes to designing a feature wall with gas fireplaces vs electric fireplaces, heat changes everything! Because there is actual combustion inside a gas fireplace, and because it heats up the wall around it, feature walls with gas fireplaces must be built with non-combustible materials. Surrounding materials also need to be non-combustible. This may limit the choice of materials on the feature wall. With an electric fireplace, there is no combustion inside, and the wall around the fireplace does not heat up, so walls do not need to be built with non-combustible materials. Because the fireplace surround may be of any material, there are endless design possibilities for feature walls with electric fireplaces. Gas fireplaces vs electric fireplaces – Which is better for safety? The safety differences between gas fireplaces vs electric fireplaces may be better understood by understanding how the flames are produced in each. In a gas fireplace, the flames are produced by burning natural gas or propane to create an attractive flame. That combustion produces heat as well as other by-products such as carbon monoxide. The heat causes the glass front on a gas fireplace to get hot enough to seriously burn skin that comes into contact, so a protective screen should be placed in front of the glass. To be sure that no carbon monoxide escapes into the home, it is important to have regular maintenance on a gas fireplace. The flames on electric fireplaces are created with LED light, and do not cause the glass to heat up. Because there is no combustion, there is no risk of carbon monoxide poisoning. Stylish Fireplaces & Interiors specializes in electric fireplaces and custom designs. Their Toronto-area showroom features over 50 electric fireplaces, fully installed, with all the finishing materials to complete a project. Their expert staff can answer design and technical questions and help to compare products. This entry was posted in Electric Fireplaces, Electric vs. Gas Fireplaces, Fireplace Design and tagged advantages of electric fireplaces, electric fireplace or gas which is better, fireplace design, fireplace heat, fireplace safety, fireplaces and tv's, gas fireplaces vs electric fireplaces.